Recently, I have seen a very nice QE comparison chart made by Philippe Bernhard that I must share with you (re-publish) as it’s really nicely done and shows today’s most popular chips’ QE curves of KODAK KAF-3200, KAF-1603ME, KAI-11002ME, KAF-8300ME, KAF6303E, KAI-4022, KAF-16803 and SONY ICX285, ICX674 / ICX694. What’s remarkable is the “difference” between Kodak KAF-3200 (costs a fortune – too pricy sensor with huge(!) noise levels and on top of it being NABG which means it’s not the best choice for an astronomical photographer who wants to make pretty pictures without care of blooming) and Sony ICX694 (or ICX674 that’s the same chip, but of a smaller size) that has really low noise. The size of chips is similar, but Sony ICX694 / 674 is half the price of KAF-3200 and delivers very clean images (I am not afraid to say that you get two to four times better camera for half of the price). It will just shine in narrow band imaging. Another remarkable fact is the difference between today’s very popular Kodak KAF-8300(ME – all are micro lens enhanced chips) and Sony ICX694 / 674. Based that KAF-8300 has e.g. 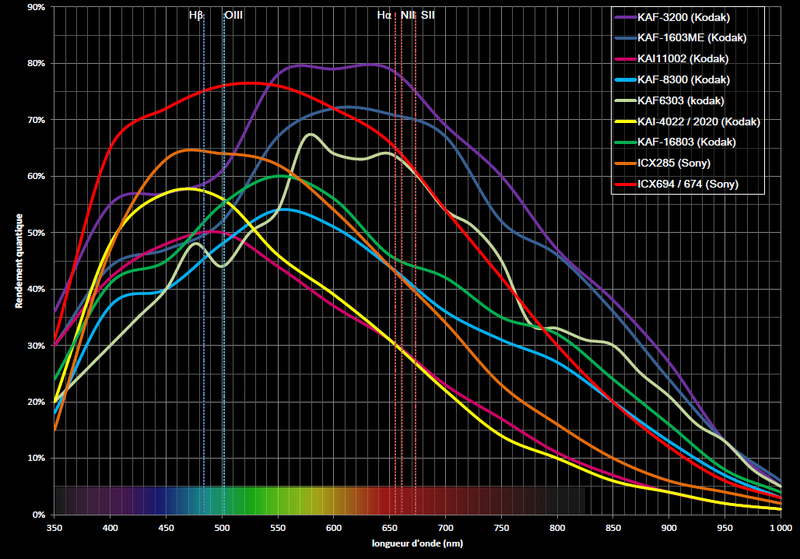 in H-alpha the sensitivity of 44% and ICX694 has around 68% there’s a difference of a factor 1.5 times in favor of Sony. On the other side, the KAF-8300 is bigger (not so bigger in width/height dimensions, but twice bigger in surface size), but again, on the other side, ICX694 has far less noise and delivers much cleaner images so it’s question whether FOV matters to you or not (FOV can be adjusted by using shorter focal length telescopes or more powerful focal reducers on the same aperture telescope). Last remark to point out is the QE of KAI-11002ME. Looks horrible (and it is horrible, in namely H-alpha shooting – from my experience it’s disaster), but in LRGB it is usable and considering the really big size of the chip it can still deliver pretty nice images when matched to an expensive astrograph that is tracked on an expensive mount. Downside of cameras with this chip is the weight and additional stress on focuser (requiring a few grands more expensive focuser). There are many QE charts available on the Internet so I show only one more made by Point Grey Research, Inc. that covers comparison of QE of following chips: SONY ICX674 / ICX694 (both EXview HAD II), IMX035, CMOSIS CMV4000, SONY ICX445, ICX285, ICX625 (both EXview HAD) and Aptina MT9V022 CMOS. 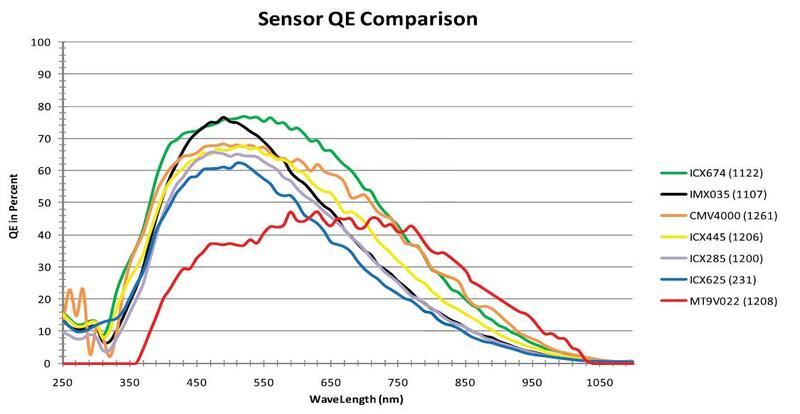 CCD's QE Comparison Chart, (c) Point Grey Research, Inc.
Notice the difference (subtle) in Sony ICX285 (grey) and Sony ICX445 (yellow) in favor of ICX445. It’s really interesting how a chip with smaller pixel size (3.75um of ICX445 vs. 6.45um of ICX285) can be equal or even better in terms of QE in comparison to highly acclaimed Sony ICX285. The answer to this mystery is the new SONY technology named EXview HAD II. 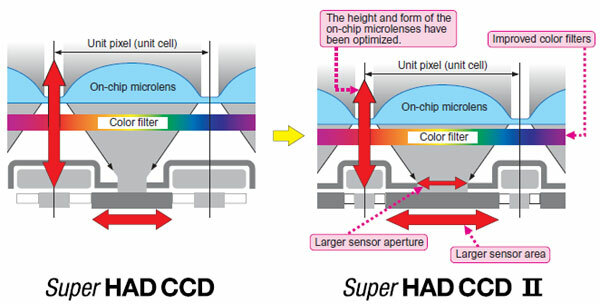 Sony ICX445, ICX674, ICX694 are all new generation CCD chips with EXview HAD II technology. See image and link below. But to be completely honest with you, reader of my mental brainstorm, the smaller pixel cameras do really have a bit higher readout noise (which is what we do not want), but surprisingly the higher QE compensates for it! I will devote another upcoming article to this problematics and closer comparison of Kodak KAF-8300 vs. Sony ICX694/ICX674 chips later. Also notice how good is the new Exmor CMOS based chips (family IMX). This one is found in planetary cameras these days as well as popular ICX618 that is superior than ICX445, but only by little! ICX618 is 1/4” (way too small with only 0.3 megapixels) and ICX445 is 1/3” (small) with decent 1.2 megapixels. My future, soon to be released, guide and planetary and meteor trails capture camera will feature ICX445 (new MII G1-1200 from Moravian Instruments) SEE UPDATE at the bottom of this article! Again, the ICX674 (green) is equal to ICX694 (ICX694 is 16mm diagonal while ICX674 is 11mm diagonal both have same pixel size). The newest EXview HAD II Sony based astronomical CCD cameras can open new doors and bring us to new horizons (or even beyond ). I would say it’s a revolution in amateur astronomical imaging. I have it all except of clear skies. Conclusion? Best is to have more then one CCD camera, each selected according to intended use - for shooting small objects like tiny galaxies or planetary nebulae you may get small chip sized camera but powerful one (high QE, low noise) while for large wide field imaging you may get as big chip as possible (like 36x24mm) that allows to capture large amount of sky without wasting time and effort on doing mosaics. Other benefit is that it allows to use big aperture telescope to collect more photons. Big aperture telescopes usually have longer focal length and slower F-stop ratio, but you can HW bin 2×2 in order to make the system faster (from say F/10 using bin 1×1 you can actually go down to F/5 with bin 2×2 – therefore big chip can serve you as a focal reducer (as long as the optics can support it – has flat field) and many megapixels guarantee you still end up with decent pixel dimension of the image). Does it match your wallet? This Article is a follow up on a post I wrote earlier for a czech astro magazine: Současné CCD kamery pro fotografování DSO, stručný přehled. Theory and praxis. Two different worlds. In praxis, it looks that ICX445 is JUST A BIG DISAPPOINTMENT. Příspěvek byl publikován v rubrice Articles in ENGLISH, Technika, recenze. Můžete si uložit jeho odkaz mezi své oblíbené záložky.